With regular use of our gel, you can have whiter teeth with a healthy shine for a fraction of what your dentist would charge. Our special formulation uses maximum strenght peroxide and extra enzymes for stain removal, and the slightly acidic pH is safe for tooth enamel. 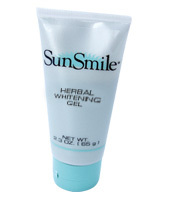 Be the first to review “SunSmile Herbal Whitening Gel” Click here to cancel reply.